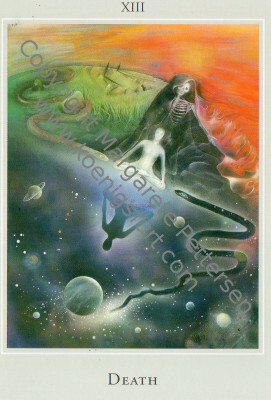 This month’s card is death from the Margarete Petersen deck. A powerful card of transformation and change, particularly external change. Often this card arises when the inner work of change has completed, the Tower experience healing us within is over and now we take action to bring about changes in the external world which reflect our new perspective on life. We let go of the old ways of acting and the old lifestyles, people and activities that are no longer for our highest good and we attract to us the new, people and activities, situations and lifestyles that more clearly reflect our authentic nature. In practical terms this can also mean a move of house, a change of job or a change of routines in our life to such an extent that we barely recognise our old way of life. Sometimes these changes, though for the better, bring with them a sense of grief as we let go of hopes and dreams associated with the old ways, before we fully move on and embrace the new opportunities life offers us. So this month in addition to making the changes you have been preparing for, also allow space and time to fully process the effects of letting go of the old activities, people and routines you were familiar with engaging with. As you allow space for the sadness and the release of the emotions attached to loss, so you also make the space for greater joy in the future and the beginnings that are also occurring. Along with the death process we also have the rebirth process. This month sees us concerned with both. What are your birthing in your life? What are you required to let go of in order for this birthing to take place? How do you feel as this process unfolds? As we ask these questions of our self this month so we come to terms with the changes happening. There are no right and wrong answers or responses, simply the acknowledgement of how it feels, and a sitting with that for the time it takes to release into the rebirth. A meditation that is good to do at this time is the letting go meditation. Often when things change we have a tendency to cling to what is familiar as it gives us a sense of being in control and a sense of safety. However this change is needed and if we allow it to occur without clinging we will find the process smoother and briefer. This meditation is where we focus our mindfulness on the out-breath only, simply allowing the rest to happen naturally, in peacefulness, then focus on the out-breath and the naturalness of letting go, that we do so many times a day. Another aspect we might find ourselves dealing with this month is our fear of death and our fear of change. As we face what it means to us to die we can begin to life in the awareness that death could be round any corner. Though this may sound morbid – if we truly embrace the sense of impermanence in this form, we can make each moment on this life count. We can learn to live more fully with death on our shoulder. If you knew there was a need to do what you really want now rather than putting it off what decisions would you make differently? Perhaps this month would be a good time to start acting on your true desires rather than putting off your own passions until a later date when perhaps you feel ‘everything will be done’. Often that time never comes as we create more and more we ‘have ‘ to do rather than simply saying we can do what we have the heart and passion for now. Changes that occur this month will likely be for the better – there is an intuitive feel that the time has come to walk out of the darkness of the recent times and into a new light and a new hope for the future. Though walking this path may take some courage and a need to face fear and risk something. Take that step you have been wanting to – that will bring about a desired, or hoped for, change in your life. Allow the natural cycle of decline and increase to bring with it opportunities and possibilities for the future you may not have considered before. Congratulations to this month’s Free Prize Draw winner DIANA. 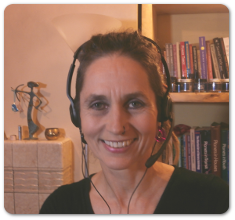 You have won a free distance reading – I have sent you details of how to claim by email.